When General Sani Abacha (1943-1998) took over from Chief Ernest Oladeinde Adegunle Shonekan on November 17, 1993, he pegged the official rate at N21 to $1US dollar. In the black market, it was running close to N50 per $1US dollar, that is if you can get it to buy. The official rate of N22 per dollar stayed throughout the tenure of General Sani Abacha. On January 16 1995, the Minister of Finance, Etubon Asuquo Anthony Ani (80) from Calabar in Cross River State, announced that the official rate of the country would be N22 to 1US dollar. He declared on that day while presenting the 1995 budget that “Our outstanding external public debt stood at the equivalent of US $29.43 as at 31st October, 1994, which includes US $6.8 billion payment. Out of the amount, the sum of US$22.7 billion was debt owed by the Federal Government and her agencies, while about US $6.7 million was debt contracted by various state governments. A further breakdown of the external financial indebtedness shows that the debts were composed of Multilateral debt—US $4.4 billion, Paris Club Debts—US $18.3 billion, Commercial Banks (London Clubs), US $2.1 billion, Promissory Notes—US $3.2 billion, other bilateral (Non Paris Club), US $1.4 billion. It is estimated that about US $4,397.762 million will be required to service current maturities and interest charges on external debts in 1995 fiscal year. Government has however decided to earmark US $2billion for external debt servicing for the year because of budgetary constraints”. He said further “as the Head of State indicated in his Budget speech, efforts will be intensified in 1995 to conclude with the World Bank and the International Monetary Fund negotiations on a Medium Term Economic Adjustment Programme (MTP), Nigeria had formulated the draft of the MTP and had been discussing it with the two Bretton Woods Institutions since 1993. Contacts have been made with the IMF and renewed efforts will be made in 1995 to reach final agreement on the programme which is expected to pave the way for Nigeria to enjoy concessional debt relief and the inflow of concessional resources from multilateral and bilateral sources. 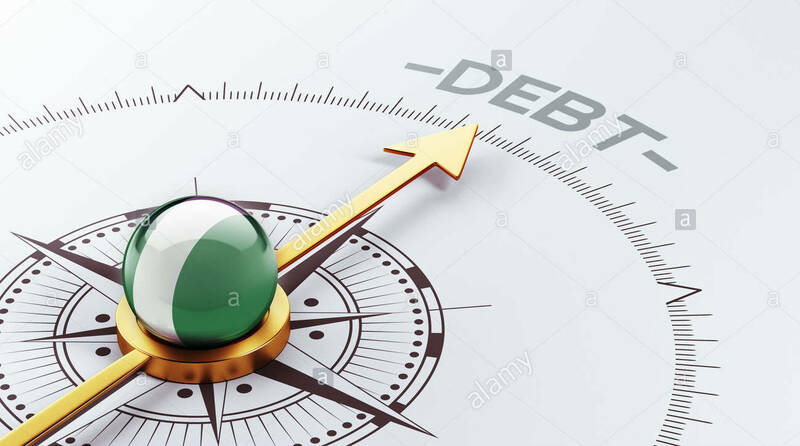 Due to Nigeria’s debt condition, external borrowing in the 1995 will focus on concessional funds which attract low interest rates and are repayable over long periods such as IDA, ADF and soft bilateral credits. Such a shift to concessional facilities will help in reducing our debt stock and in the long run mitigate the spectra of negative net transfer of resources. However, given the fact that concessional funds like IDA resources are very limited and are being demanded by increasing number of countries, we may be constrained to seek fund from other sources such as IBRD, ADB and the International Capital Market as well as bilateral credits for projects that are highly profit oriented”. The confirmation by the Vice President, Professor Yemi Osinbajo that our debt profile is now over $73 billion dollars is disheartening considering that 13 years ago when we got the debt relief, we were celebrating. Since that time we have had four Presidents—Olusegun Obasanjo, Shehu Musa Yar’dua, Goodluck Jonathan and now Muhammadu Buhari. Since then too we have had five Ministers of Finance—Dr Ngozi Okonjo-Iweala, Mrs Nenadi Usman, Dr. Olusegun Olutoyin Aganga, Mrs Kemi Adeosun and the present, Hajia Zainab Shamsuna Ahmed. We were told as helpless as we are, that these ministers were Economic magicians especially Dr. Okonjo Iweala who served between July 15, 2003 and June 2006 and again served from August 17 2011 and May 29 2015. With all the knowledge of these “economic experts” as Ministers, yet the worst is not over. But we have to refer to the two speeches given by President Olusegun Obasanjo while in power on our debt profile. The first was on June 30, 2005 in his broadcast to the nation when we got debt relief and the other was on July 26, 2005 when he addressed the National Assembly in Abuja. In the two speeches he gave us hope for us to celebrate and now thirteen years after there is nothing to celebrate. Certainly there must be something wrong somewhere. On June 30, 2005, when we got the debt relief, President Obasanjo in his broadcast to the nation declared “It is with great joy that I address you today on one of the pillars of success of this Administration. I address you on it for several reasons. First, it is important that, as always, I bring your attention issues of national importance. Second, it has far-reaching implications, in a positive sense, for our reform agenda. Third, we have collectively worked hard for it and now that the results are evident, we should all savour it and draw bitter lessons from the profligacy of the past. Fourth, it vindicates the steadfastness, sacrifices and tenacity of this government in its struggle to win relief from the global community in order to give us the required breathing space to make more progress. Six years into the present democratic dispensation, we have definite achievements and dividends of democracy to report. Since April 1999, after my success in the election of 199 and pending formal inauguration, I was opportuned to travel to some important countries of the world to meet with their leaders in preparation for assumption of office. As early as that time, I was already asking world leaders for debt relief for Nigeria in addition to wooing investors. What we have now has been given assurances to expect by the Paris Club is that Nigeria will clear its arrears of $6 billion of the $30 billion owed, following which there will be a stock reduction on Naples Terms while we will have to buy back the remainder. This will represent, for the first time, a total exit, if you like, total freedom from Paris Club debt. “Fellow Nigerians, how did we get to the point where our debt burden became a challenge to peace, stability, growth and development? Without belabouring the point, we can identify political rascality, bad governance, abuse of office and power, criminal corruption, mismanagement and waste, misplaced priorities, fiscal indiscipline, weak control, monitoring and evaluation mechanisms, and a community that was openly tolerant of corruption and other underhand and extra-legal methods of primitive accumulation. These all took place in this country, before our eyes, and at times in active complicity by many of us. Even community leaders and religious bodies accommodated corrupt individuals and exalted them. Money replaced traditional values, money took over our souls, and we came to believe in the Machiavellian philosophy of the ends justifying the means. State governments contracted huge loans with outrageous conditions and interest rates and failed to perform with the funds, most of it being squandered on white elephant projects or simply looted. We often forget that stolen and wasted funds were monies meant for growth and development especially education, health, roads, water, electricity and other social services. Contracts became the only basis for determining transactions and engagements within the public and private spheres. We pray to God that we get beyond these debilitations and develop a collective conscience that is anchored on transparency, accountability, probity, value-for-money and due process. “How did we work to get out of this debt quagmire? We did it by resolving and working hard to break with the past; by identifying new voices and new leaders; and by rejecting business as usual and voting for new values of accountability, transparency, fair competition, social justice, and the upliftment of the living standards of Nigerians. We revamped our institutions and put in place an economic reform agenda that reduced the role of the state in the economy while strengthening the place and role of private investors. We mounted a vigorous global campaign to make a good case for debt relief. We contended that in spite of being an oil producing country, Nigeria was not a rich nation with a population of about 150 million. With such a population, on a per capita basis, oil receipts came to less than 50 cents per Nigerian per day. What we would gain from the expected debt relief will allow us to put additional $1 billion or N130 billion into human welfare budget of health, education, food security and infrastructural development. We were not defensive about the past but we were optimistic and proud of our future. We mounted an unprecedented war against corruption in all its ramifications also with unprecedented results. We drew attention to our numerous sacrifices in West Africa and Africa at large in peacekeeping and conflict resolution, a task that has saved billions for the UN and developed countries.